Not for the first time and, no doubt, not for the last time, the Dainton brewing team has been playing around with fruit. 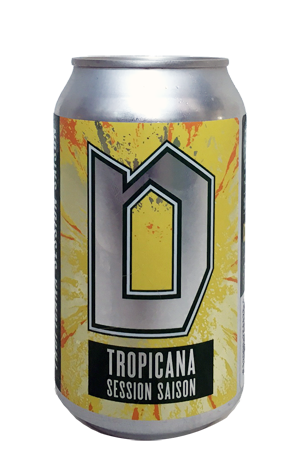 Not just fruit either, with Tropicana a beer that was kettle soured before welcoming a saison yeast strain and pineapple into its midst. That's a fair few ways in which the beer could be twisted, be it the spicy, fruity, peppery, funky elements that might come from the yeast, the acidic tang from the kettle souring and the fruit itself. And yet it's ended up rather, dare we say it, straightforward. It's pale and hazy, there's a touch of fruitiness to the aroma, albeit as much lemon as it is pineapple, there's a tickle of acid, a hint of malt sweetness and the saison yeast characteristics are waving from afar and contribute to a dry finish. Yet the overall impression isn't too far off a beery take on Solo. Which, given it's tagged a session beer, may be just the sort of thing they were after.